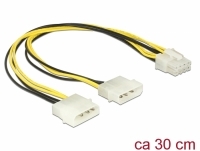 This power cable enables you to convert the interface of the common ATX power supplies into the SATA format for the power supply of SATA drives. 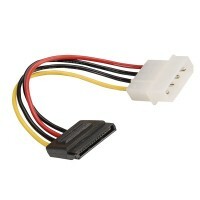 The angled SATA connector leads the cable upwards from the SATA HDD so that you can still connect your drive in spite of space problems. 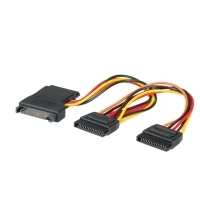 This power cable enables you to connect and supply power to 2 SATA hard disks via one SATA 15pin port of a power supply. 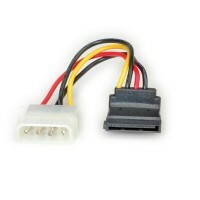 This power cable enables you to convert a PC power supply with SATA interface into the Molex format for power supply of devices with 4 pin Molex connector. 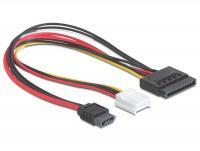 This power cable by Delock can be connected to a free Molex interface of your power supply and supply power to different devices with SATA power connector and P4 connector. 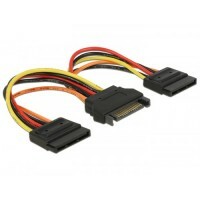 This power cable enables you to connect and supply power to 2 SATA hard disks via one SATA 15 pin port of a power supply. 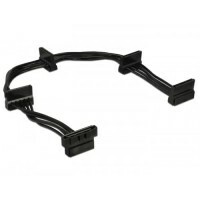 The angled SATA connector lead the cable downwards from the SATA HDD so that you can still connect your drive in spite of space problems. 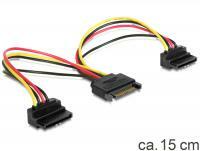 The metal clips on the SATA interfaces provides additional stability. 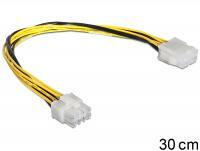 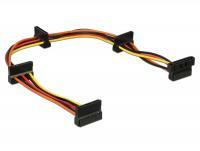 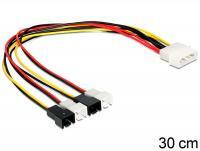 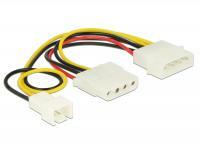 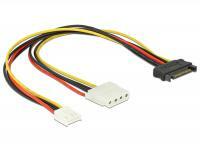 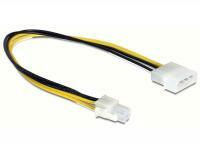 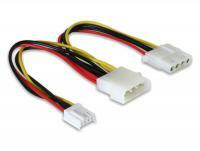 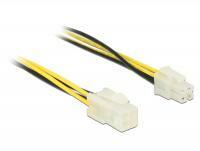 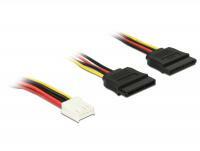 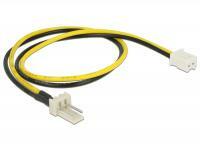 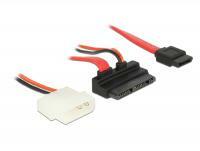 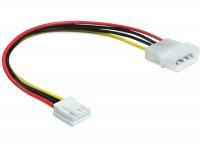 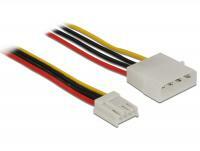 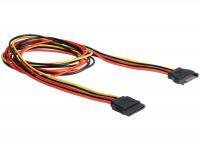 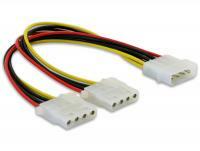 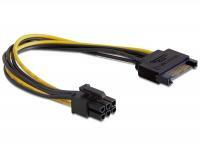 This cable can be used for the extension of the SATA power interface. 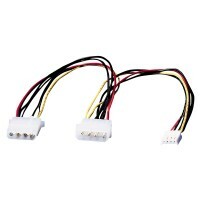 This Y-power cable enables you to connect and to supply power to two SATA devices via SATA 15 pin port of a power supply. 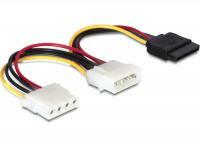 This power cable enables you to connect a device with 4 pin power connector to a PC power supply with SATA 15 pin interface. 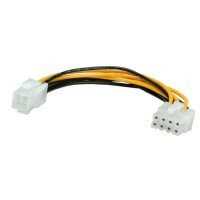 This power cable can be connected to 4 SATA devices and supplies power via one SATA 15 pin port of a power supply. 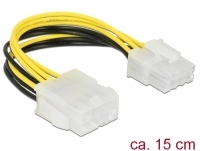 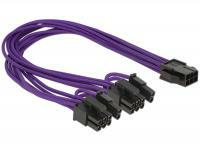 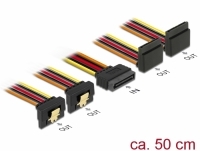 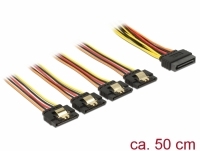 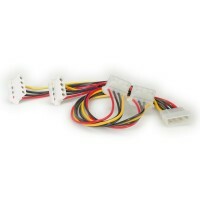 This power cable can be connected to 4 SATA devices and supplies power via one Molex 4 pin port of a power supply. 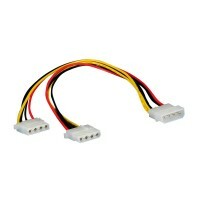 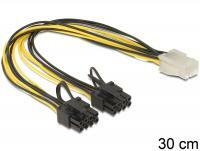 This cable can supply power for two SATA devices via one free SATA 15 pin power connector of the power supply. 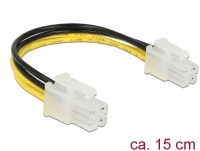 This 30 cm Y-power cable by Delock can be connected to a 15 pin SATA power port of a power supply and can supply power to an IDE HDD and floppy drive. 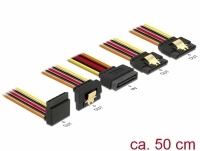 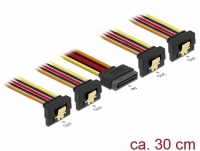 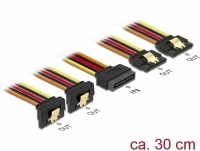 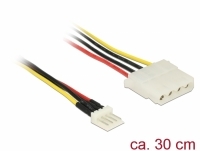 For all travla housing- Power cable for connection to the motherboardfor DC-DC Converter Board- Replacement cable, cable length approx 21cm- 2x 20pin / 2x 3½ "
This Delock power cable can be connected to a power supply with SATA interface and enables the power supply for PCI Express cards, e.g. 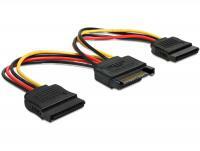 PCI Express graphic cards. 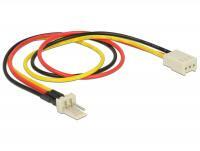 This power cable by Delock can be connected to a Molex power port of a power supply and can supply power to a floppy drive. 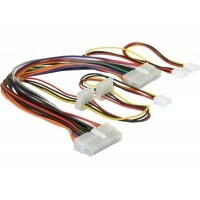 This cable by Delock can be used for power supply of up to 4 fans at the same time by connecting it to a free 4 pin Molex interface. 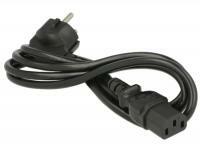 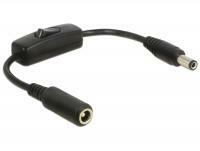 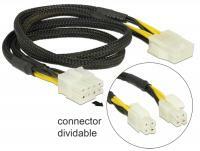 This power cable by Delock can be used as extension of the 8 pin EPS interface and can be applied e.g. 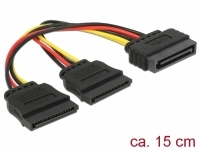 for connection of your mainboard. 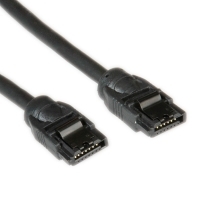 Furthermore the 8 pin EPS male connector can be devided into two 4 pin male connector. 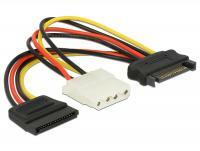 Thus you can also provide a power supply through the 4 pin port of your mainboard. 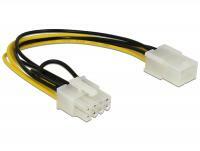 This power cable by Delock can be used for connection of a fan with 3 pin female port to a mainboard with 2 pin male. 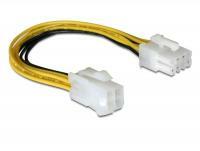 This power cable by Delock can be used as extension for connection of a fan. 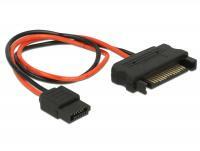 The integrated resisitor enables you to run e.g. 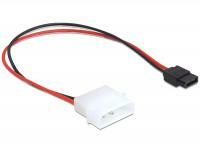 a fan with 7 V instead of 12 V. This leads to a calmer operating noise, which contributes to a reduction of the total noise inside the enclosure. 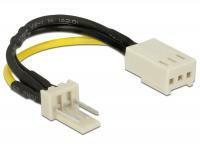 This power cable by Delock can be used as extension for connection of a fan. 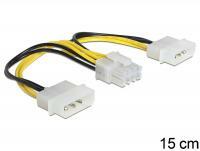 This cable by Delock can be used for power supply for a fan or CPU cooler directly through a power supply unit with 4 pin interface. 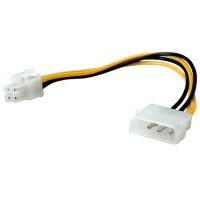 Furthermore you can connect another device with 4 pin port through this cable for power supply. 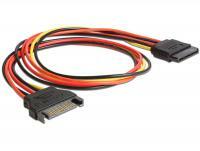 This Delock power cable can be used for power supply of PCI Express graphic cards, which need a high power consumption and have two 8 pin respectively 6 pin power connector. 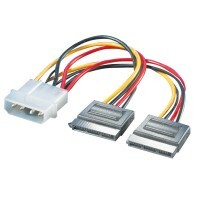 At both 8 pin male ports you can remove two pins thus you can get the 6 pin PCIe interface. 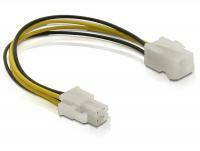 This power cable by Delock can be connected to a 4 pin power port of a power supply and can supply power to a floppy drive. 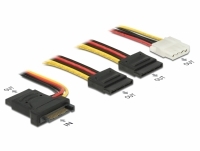 This Micro SATA cable by Delock enables the connection of 1.8â³ hard disk drives with 5 V with Micro SATA port. 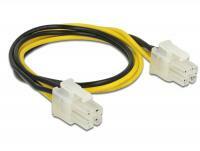 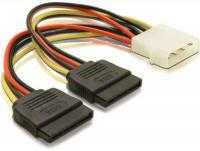 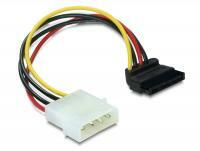 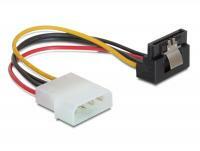 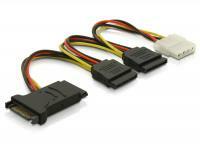 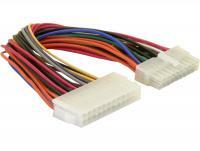 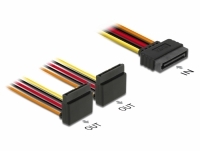 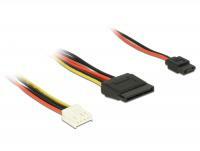 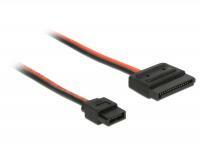 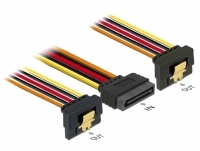 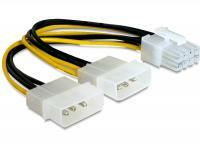 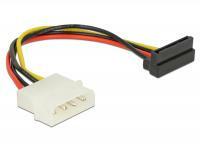 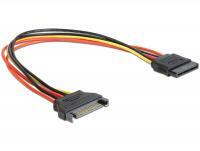 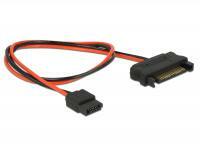 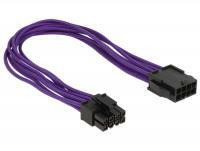 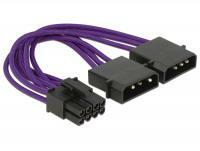 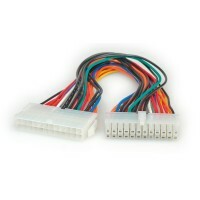 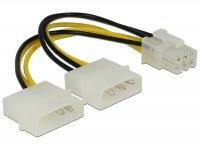 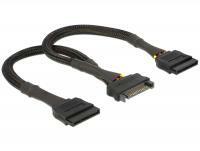 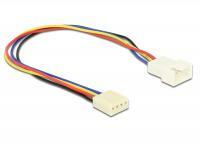 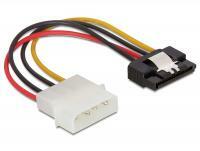 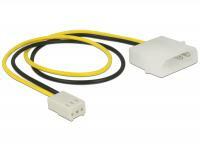 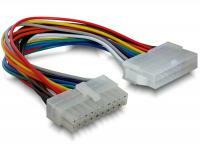 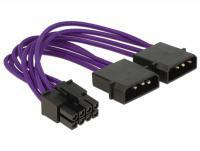 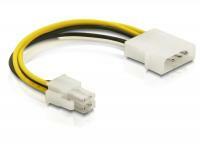 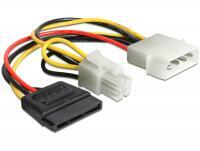 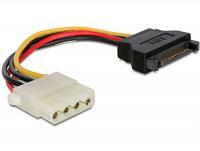 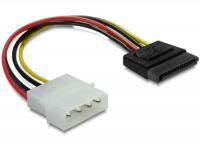 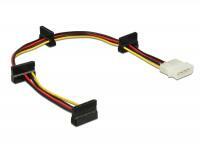 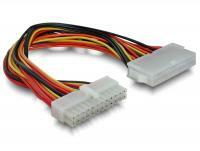 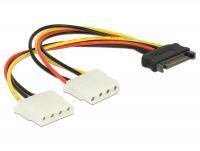 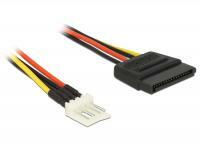 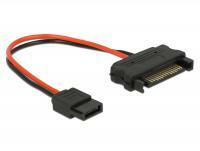 This cable by Delock converts a SATA 15 pin receptacle into a Slim SATA 6 pin receptacle. 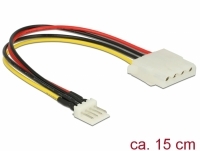 This power cable by Delock can be connected to a Floppy 4 pin power connector plug on a mainboard and it enables the power supply of two drives with SATA 15 pin plug. 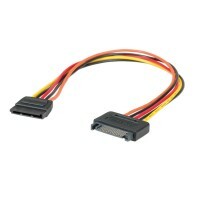 This cable by Delock enables the power supply of a device with a Slim SATA 6 pin power connector, such as a DVD drive, over a free SATA 15 pin power connector of the power supply. 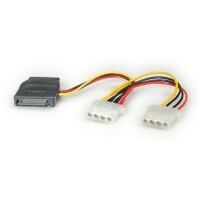 This cable by Delock enables the power supply of one device equipped with a 15 pin SATA port and one device with a 6 pin Slim SATA port over one free 4 pin Floppy power connector on the motherboard. 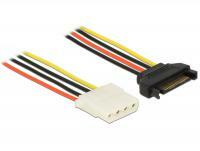 This cable by Delock extends the connection between a power supply and a motherboard equipped with a P4 4 pin power connector.